The birth certificate of George John Musgrove second son of George and Emily. George was born on the 6th September 1875. George and Emily were still living at Bedford Lodge Balham. George John Musgrove was baptised on 22nd September at St Marks Church Kennington. Its interesting to note that none of George and Emily's later children were ever baptised. The maps below show the location of Bedford Lodge, located beside Balham House in Balham Hill, later named Balham High Road. The map on the left dates from the 1860's The map on the right is ten years later and shows the redevelopement of the immediate area at the time George lived here. Note that Ramsden Road had now been built through the gardens of Balham House. 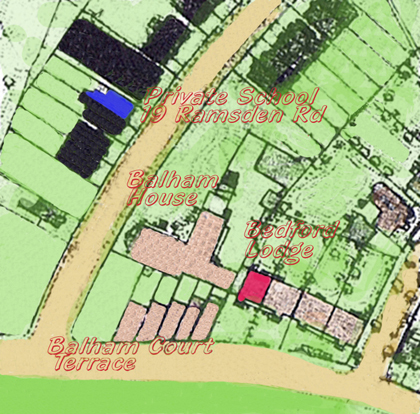 George's daughter Christiana now aged eight went to the Eliza Walters Ladies School at 19 Ramsden Road (marked in blue). Eliza Walters married soon after and continued running the school as the Eliza Hanson Boarding School. George and Emily's stay at Bedford Lodge was short. Local Directories unfortunately don't show the Musgroves, they show Robert Sketchley living at Bedford Lodge in 1873 and Thomas Norton living there in 1878. In November 1876 Emily Sophia Musgrove was born in Hatfield Peverel Essex so they had left Balham by this date. However Christiana remained at the Boarding School until about 1884. 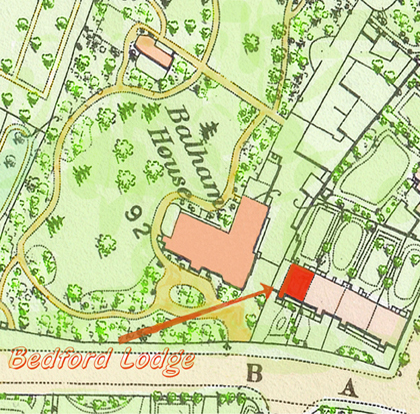 Bedford Lodge was demolished in 1886 when the shops in Balham Court Terrace were extended eastwards. Balham House was later demolished and is the site of the current Balham Library. Balham Court Terrace was also later demolished and is now a large car park for the library and the supermarket built over Bedford Lodge and adjoining properties.